Lower Back Pain and Exercise - Why Pilates? What's the connection between lower back pain and exercise? Sometimes doing certain exercises can help and sometimes not. I have done Pilates for a long time and even though I may have had strong core muscles a wrong move can cause even the fittest among us to fall in a heap of pain. I know about this connection between lower back pain and exercise because I twisted my back moving an oversized pottery pig and fell down in a heap wondering "Now What?" For the next few days I gently used my Pilates exercises to stretch my back into shape. Such as doing back stretching exercises like the cat stretch here shown to the right. This exercise gently rocks your spine from flexion to extension loosening the back muscles and strengthening the abdominal muscles. This is where exercises for the lower back done at the right levels, with proper form, and paying attention to how your body is feeling can be just what helps your lower back pain. Low back pain and exercise can be a good combination when using the Pilates principles. I feel this is the safest and most effective way to keep your spine and joints healthy and to rehab them when injured. Pilates exercises are well know to be rehabilitative and corrective in realigning the spine and other joint displacements. Pilates, in effect, stretches the tight muscles and strengthens the weak ones. This is why when you have lower back pain and exercise the muscles incorrectly it can cause more pain and spasms. When using Pilates for back pain you stabilize the core or trunk first by using the abdominal muscles to protect the back muscles from spasms. While strengthening or tightening the abdominal muscles you are at the same time stretching the affected tight or spasmed back muscles. This may or may not work in every case. The exercises outlined in my Pilates youtube video below will show you exactly how to stretch the right way to heal both upper and lower back muscles that have strained or sprained. This description may seem opposite of what you are used to, but it has helped numbers of people who have come to me with both upper and lower back pain. When Pilates exercises are done consistently over time it can help to prevent the lower back pain you feel during exercise or just doing activities of daily living and prevent further pain during exercise. Doing Pilates 3-4 days per week over a consistent time period of 4-6 weeks can help to decrease the effects of a painful back as well as other joints. 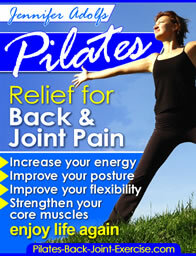 Leave Lower Back Pain and Exercise and learn more Pilates exercises for a healthy back!